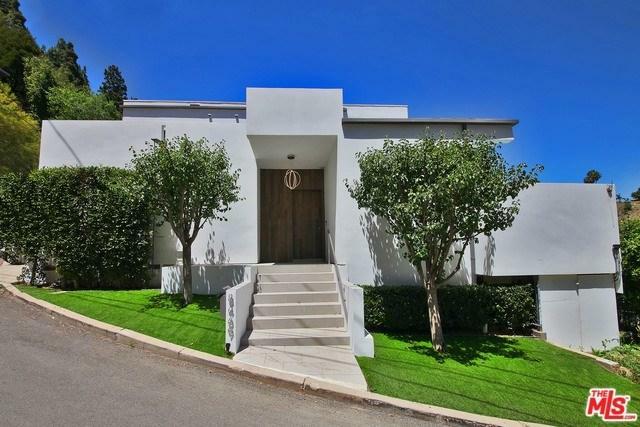 Contemporary entertainer's dream home perched above the Sunset Strip and nestled in the most exclusive area at the end of a quiet cul-del-sac. This four bed(plus bonus detached fitness room & sauna) and five bath showpiece boasts panoramic views from downtown to the ocean. Open floor plan surrounded by floor to ceiling walls of glass creating light and space for ideal indoor-outdoor flow. Private pool with waterfall and spa over looking the city. Master bedroom offers a separated office with views. Showcase wine wall and a wine cellar that can be viewed through the glass living room floor. Sizable yard with outdoor built-in kitchen and service bar. Move-in ready, perfect for the most discerning clients seeking complete privacy with every amenity included! This home combines the best of hillside and metropolitan living. Easy to show.